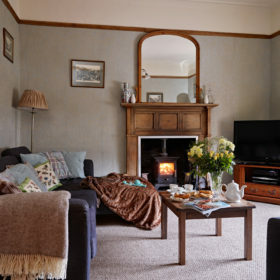 River Glaslyn House is huge and homely, a place where the hob always bubbles and the fire crackles. 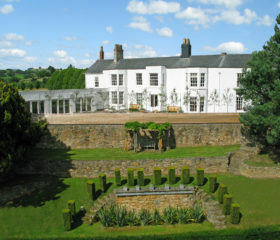 Walk the hills, take a coffee on the terrace or a Pinot from the cooler. 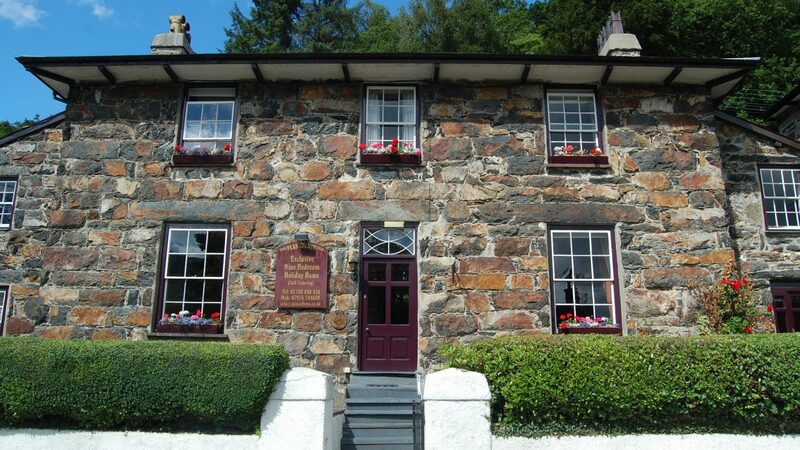 The river rushes by, the mountains of Snowdonia soar in the huge sky, the boots sit by the back door. Let the mountains set the mood. 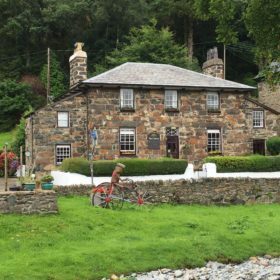 Amid the tumbling streams and soaring mountains of the Snowdonia National Park, River Glaslyn House is a huge and homely grade-II listed holiday cottage perfect for groups and families. 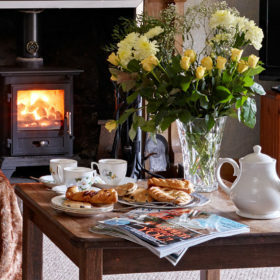 This is a place where there’s always something bubbling on the hob, always boots by the door and always a fire on the go. 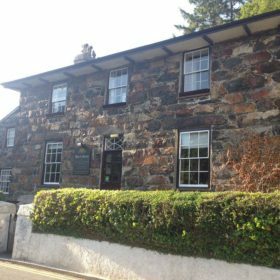 Crafted from local stone, nine-bedroom River Glaslyn House sits just yards from the Beddgelert post office and store, the beating heart of the village where locals shop for a loaf and stop for a natter. The bridge fords the rushing stream, the mist gathers around the mountains and you hardly need to squint to believe you’re in Switzerland. 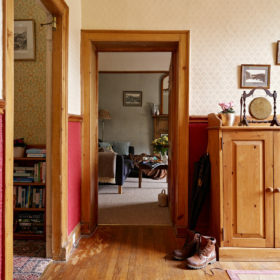 The house is a hearty collection of stripped original floors, warm beds and old oak doors. It’s a world of Welsh dressers. 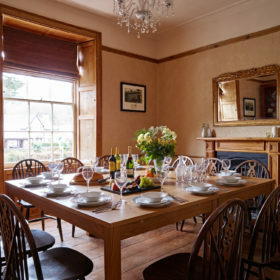 There’s space for 20 around the dining table, so serve up a stew from the range and ceramic hob, pick a Pinot from the wine cooler, light a candle and let the mood work its magic. After a long walk, the terrace table and chairs invite a coffee or the aroma of smouldering coals and sizzling steaks in the mountain air. Tap into the superfast wifi. 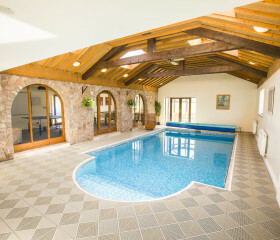 Distract the kids with the playroom. Relax in the gin-and-tonic garden room. 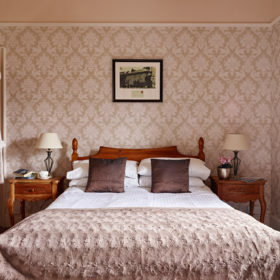 Sleep deeply to the sound of the rushing river and wake to views of Moel Hebog. Nature’s abundance is the true garden here. Snowdonia spills all around: the river rushes by, the misty mountains tower overhead and the placid lakes offer up a glassy calm. Out on the deck around the terrace table, the clear mountain air is perfect for coffee and toast at breakfast, sizzling some sausages for lunch or maybe a cheeky aperitif before dinner. The green bits are a challenge all by themselves. Kids will love scrambling up the mini-mountain to steal a view of the village and the soaring backdrop. Explorers can keep on going to meet the adjoining hill, for a walk right out of the gate. It’s a light, bright start. Through the heavy front door, you step onto a stripped pine floor with the original grand main staircase rising ahead of you. 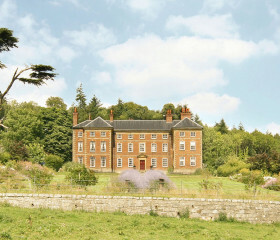 Raid the cupboard here for Monopoly, Scrabble, Trivial Pursuit, Cluedo and other classics. Onto the inner hall for books, leaflets, maps and walking routes. 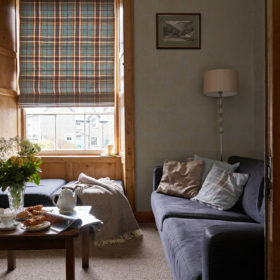 Off the main hall, the lounge is home-comforts cosy, with sofas, stools and coffee table. 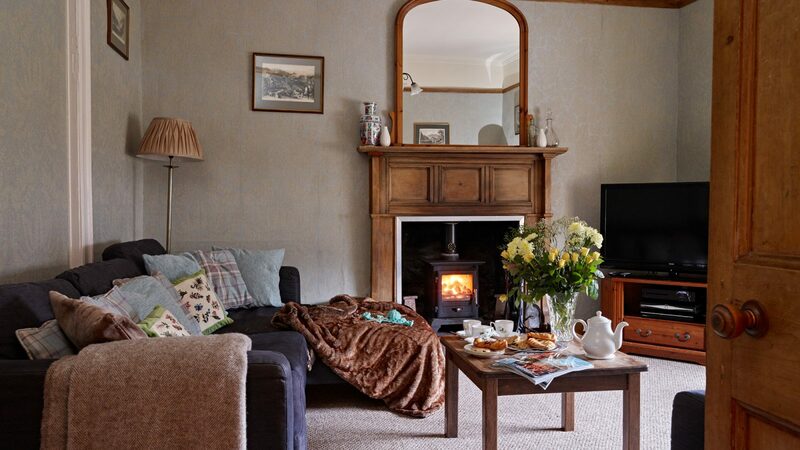 Get the logs blazing and toast your marshmallows as you get together around the Sky flatscreen TV for a film night. There’s a bookcase for bookworms and wifi whistles around the place at a mighty 40 meg. There’s more teenage tech in the playroom, with an Xbox and Wii. If the kids are elsewhere, make it your own breakout space with a DVD or book. For real relaxation, take your coffee and croissants to the garden room, unfurl your paper and throw open the French doors. Later, this can double as the G&T room. 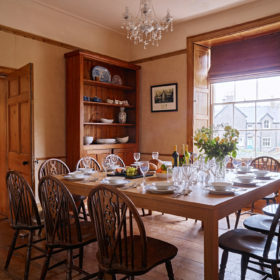 The dining room’s original Welsh dresser, with its displays of large serving dishes and China tea plates, sets the homely mood. 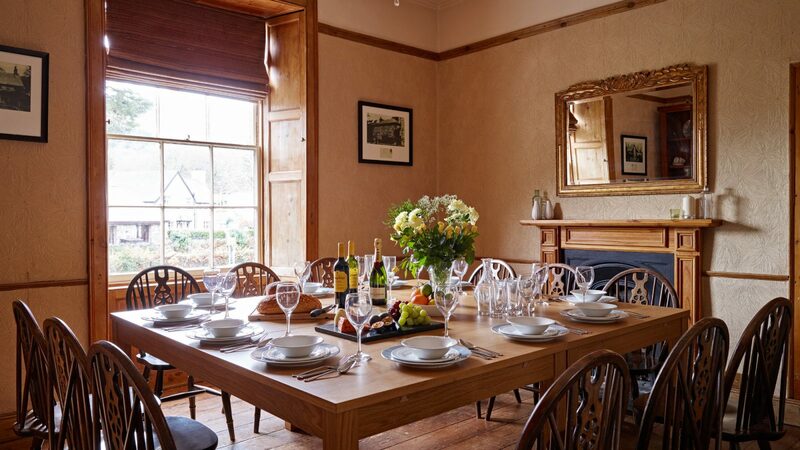 Two tables extend to make a hearty get-together for 20. 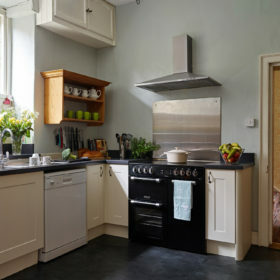 Muck in on the range cooker and two further ovens or let us take over as you sip a Sauvignon from the wine cooler and chill. Mod cons come in the shape of two dishwashers, toasters for midnight munchies, American-style fridge freezer, two kettles, and filter coffee. Eat in, or eat out beneath the soaring mountains around the deck tables in the clear mountain air. 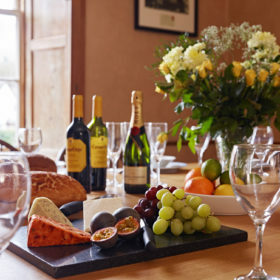 A three-star hotel with restaurant, pizzeria and award-winning ice-cream parlour is just a pleasant stroll away past stone cottages in the lee of the Snowdonian mountains. 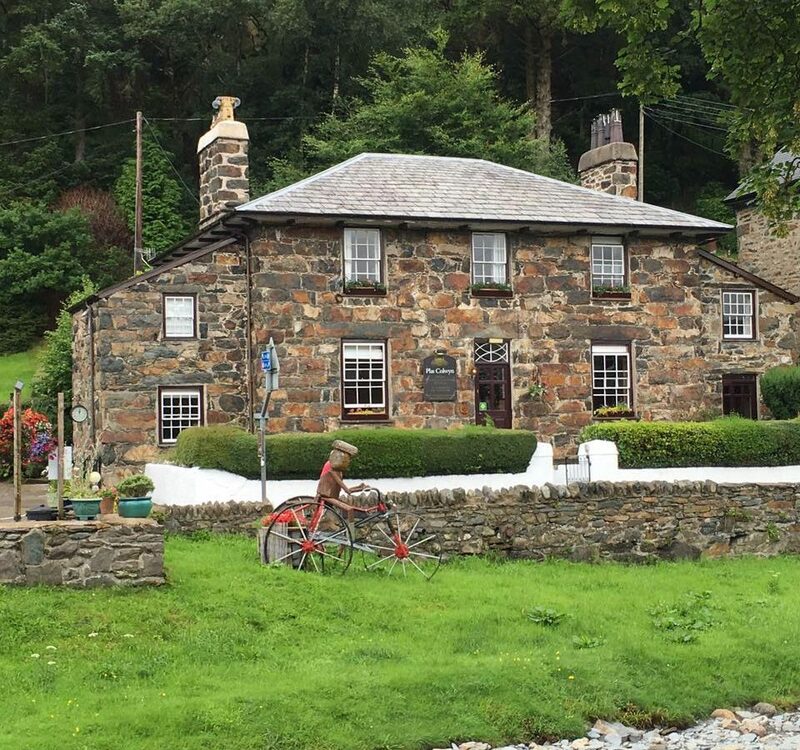 Try a full English at Hebog Bwyty and Llety, or munch coffee and a cake at the Gwynant Café after walking the Watkin Path to Snowdon’s summit. 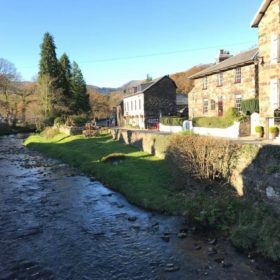 There’s hearty food and fine ale available at the Tanronnen Inn, while, for cake and a cuppa where the bridge crosses the river, it’s the Beddgelert Antiques and Tea Rooms. For a homely, home-made treat, try the Café Colwyn’s hot coffee and slice of bara brith. 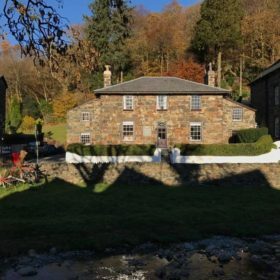 There’s no shortage of accommodation at River Glaslyn House and all of it set to a soundtrack of water and to vistas of the garden, or misty Moel Hebog and the river. 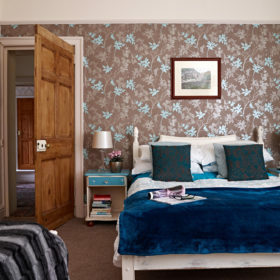 At the back, bedroom one is a large double in turquoise shabby-chic overlooking the back garden, with potential to add two children. 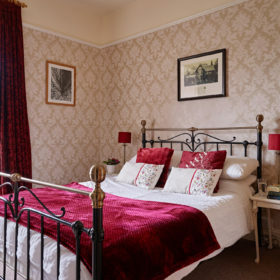 Bedroom two is a double en-suite that comes with beautiful views of Moel Hebog and the river to the front. Bedroom three has full-size bunks and stunning views. 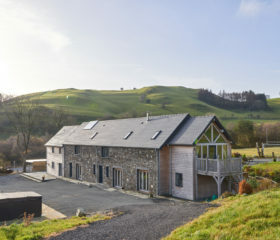 Room four, a double with en-suite shower, also captures those views of Moel Hebog and the river, while bedroom five is a large twin overlooking the decked area. 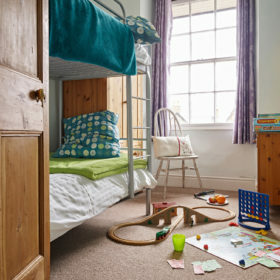 Room six is a ground-floor double with en-suite bath and shower, bedroom seven is a twin, while bedroom eight has a double bed and original mahogany wardrobe. Take the winding stairs to bedroom nine, to enjoy fabulous, twin-aspect views. 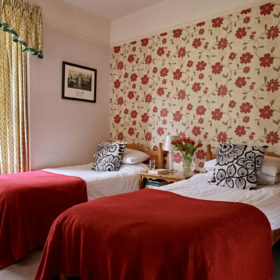 For extra accommodation, the annex has its own entrance, kitchen, shower room, WC and TV-equipped bedroom that can convert to twins. 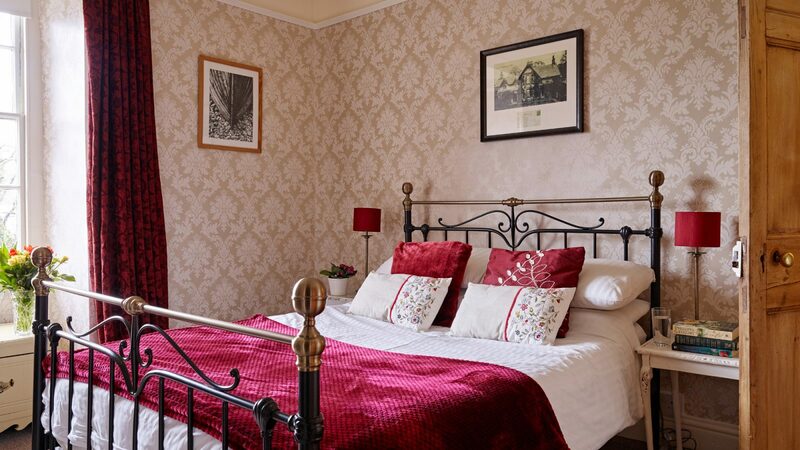 Whichever room you choose, you’ll nod off in no time in the clean air to the sound of the river running over rocks. 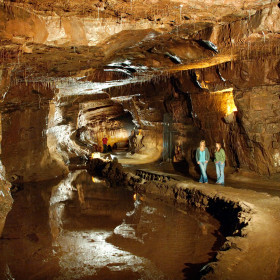 Go underground at the Sygun Copper Mine; go further underground on trampolines suspended in caves at Bounce Below. 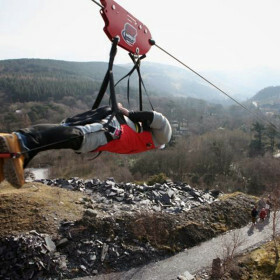 Or fly high at Zip World, for one mile at over 100 mph on Europe’s fastest zip-wire system. 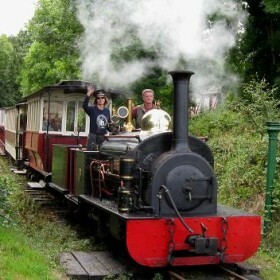 Ride the steam trains, trek the peaks, discover ancient castles, fish the Glaslyn. 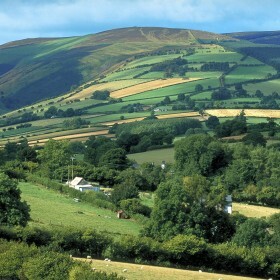 North Wales is an outdoor dream.